With a free screen recorder, it's easy to capture and share footage straight from your desktop. Fancy showing other people how to play big name games on YouTube? Would you like to make demos to show off your apps, or to teach others how to use specific software? We've got the tool for you. The simplest screen recorders simply capture what's on your screen and save it in AVI format, but the more advanced free tools also offer editing, picture-in-picture, live streaming, and gameplay optimization. You don't need to own the best laptop to do most of these tasks, though it does help. However, you have to be careful – many free recorders will add unsightly watermarks to your clips or let you record only a handful of videos before demanding payment, so it's essential to pick the right software first to avoid disappointing results. Check out our list of best screen recorders for all platforms. If you’re a keen gamer, OBS Studio is easily the best screen capture software for you. Unlike the hugely popular FRAPS (which only lets you record for 30 seconds at a stretch unless you’ve bought a license, and applies a watermark to the resulting footage), OBS Studio is open source, and completely free to use without restrictions. Free screen recorder OBS Studio supports both streaming and recording in high definition, with no restrictions on the number or length of your creations. You can stream live to Twitch or YouTube gaming, save projects and come back to them later, or encode your footage in FLV format and save it locally. Because OBS Studio can record directly from your graphics card, it’s able to capture games running in full-screen mode (many other screen recorders can only record if the game is windowed), with customizable hotkeys to control the recording. OBS Studio can also make full use of multi-core CPUs for improved performance, and can record at 60FPS (or even higher). It might take a little while to set it up exactly how you want, but OBS Studio is by far the best and most powerful screen recorder for gamers. OBS Studio is our top choice for recording from a desktop or webcam, but Flashback Express comes an extremely close second. Despite being a free version of a paid program, FlashBack Express won't put ugly watermarks over your recordings or impose time limits, and it's packed with features and tools that rival many premium programs. Its interface is less intimidating than OBS Studio, so if you've never used a screen recorder before, it's an excellent choice. That’s all fairly standard fare for a free screen recorder, but take a minute to dive into Flashback’s advanced options and you’ll find a wealth of thoughtfully designed settings that will make your desktop recordings look truly professional. The recorder can automatically obscure passwords entered on screen, replace your silly wallpaper with a plain one, hide messy desktop icons, and highlight your mouse pointer to make it easier to follow. There's also a dedicated gaming mode that lets you define the number of frames recorded per second. Following a recent update, Flashback Express can export in WMV, AVI and MP4 formats, eliminating the need for a separate video converter, and it no longer requires a free license key for activation – just install the software and you're ready to start recording. Developer Blueberry Software has also released a free screen recorder designed specifically for games – FBX. This recorder captures HD in-game footage, with hardware acceleration for AMD and Nvidia cards, and Intel CPUs. If you're thinking about upgrading to FlashBack Pro, Blueberry software is offering TechRadar readers an exclusive 40% discount. If you want to record a presentation, software demonstration or tutorial, give Apowersoft Free Online Screen Recorder a try. It's a browser-based tool, which means it's not suitable for games, but for any other tasks it's ideal. The first time you use Apowersoft Free Online Screen Recorder, you'll be prompted to download a small launcher application. You'll then be provided with a control bar packed with more options than you'll find in most desktop screen recording software. You can capture footage from your desktop or a webcam, and record audio from your PC, microphone, both or neither. You can record the whole screen, select an area manually or choose one of the preset resolutions – ideal if you’re recording a clip for YouTube, for example, and don’t want to use a separate video editor to resize it later. Apowersoft Free Online Screen Recorder also offers customizable keyboard shortcuts for speed and convenience. You can choose whether or not to include the cursor in the recording and take your pick from a range of output formats including MP4, WMV, AVI, MOV and many more. You can even add annotations during the recording. Once you’re done, you can save the recording as a video file or GIF, upload it directly to YouTube or Vimeo, or send it to Google Drive or Dropbox. You can also edit the clip. Selecting this option will download an additional component – Apowersoft Video Editor – which lets you make simple adjustments before exporting your video in your preferred format. A truly exceptional tool. Note that the 'Download desktop version' button links to a program called Apowersoft Screen Recorder Pro. This is a trial version of a premium application, and is more limited than Online Screen Recorder. 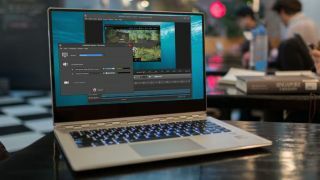 Debut Video Capture is a new addition to our roundup of free screen recorders, and although its slightly dated design does it few favors, it's an extremely powerful program that can do much more than just capture what's happening on your PC monitor. In addition to basic screen recording (with no time limits or watermarks), Debut Video Capture can also record footage from external devices, including webcams and security cameras. It can even record on a regular schedule, which means it can become the main hub of a home security system. Not too shabby for a program that's totally free for personal use. There are no post-production editing tools, but you can apply filters and add your own captions and watermarks before you begin recording. There's no option for exporting videos directly to YouTube or Facebook, but they can be saved in all the main formats, including MP4, MOV and AVI (to name just three). Debut Video Capture is currently in public beta, so we look forward to seeing the final release version with a lick of extra polish soon. ShareX is an open source app for capturing still screen grabs and recording videos. There are no watermarks or time limits to worry about, but the interface isn't the most intuitive in the world so you’ll be best off using keyboard shortcuts. For quick reference, you can start a recording by tapping Shift + Print Screen, and stop it again using Ctrl + Shift + Print Screen. Not only is ShareX a brilliant free screen recorder, it can also capture an entire scrolling webpage, capture and identify text via OCR, and even capture your screen according to a schedule. Another of its best features is the ability to send your captured grabs and videos straight to a file-sharing or social media site. There’s a vast array of options, which you can check out on the project’s site. Unfortunately, ShareX doesn’t support taking screen grabs or recordings from games running in full-screen mode. Other than that, it’s a superb screen recorder that will serve you extremely well.